The seasonal dynamics and beauty of pond keeping are just one of the many reasons to take up the enjoyment of being a koi pond water garden keeper. Each season brings with it a new pond keeping experience. Winter pond keeping holds a unique charm. The season’s daily changes can make for dramatic scenes around your pond. 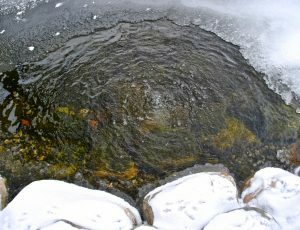 The winter pond with it’s super clear water, intermittent snow cover, and ever changing ice formations provides an enjoyment unmatched by the other seasons. Winter pond scenes and visual beauty is second to no other time to year. Yet, as beautiful as the icy blanket that can cover our koi ponds and water gardens during winter is, most pond keepers need to limit the icing on the pond to a certain degree, and I don’t mean 32F. The icing over of a pond that contains koi and goldfish needs to be kept in check. Koi and goldfish ponds should ideally have at least a small area that has been de-iced to allow for some of the functions of the pond, like de-gassing and oxygenating, to perform more efficiently. So how do pond keepers achieve ice free areas when Ol’ Man Winter is doing his best to keep your pond frozen? There are several methods of de-icing a pond that water garden and koi pond keepers can practice with very little effort. Some of these methods are age old, other methods fully utilize todays technology and latest pond equipment. All of these methods have varying degrees of investment that need to be made as well. And none of these methods heat your pond, they are all simply de-icers which will create a small open area of ice on your otherwise frozen pond. If you want to go age old you can try something as simple as tight bundles of straw placed around the edges of your pond. This method has been practiced since Victorian times and probably even much earlier. The straw will not freeze to the point of obstructing gases from leaving your pond, and will allow a way for oxygen to get into the pond. When Spring arrives a bit of clean up will be necessary since the straw will decay a bit over the winter months. If you want to try a cheap DIY method, try utilizing empty 2 liter plastic soda bottles partially submerged in the pond to help keep a somewhat open area of water. Swimming noodles, and beach balls have also been used in the same way. These are certainly not the most efficient way to de-ice a pond and tend to make a pond look a little messy, even trashy; however the small open areas these items provide will allow for a some de-gassing to happen. A little de-gassing is better than none. This is truly DIY and a method that pond pros will not offer, and if they do, well, caveat emptor. If you want to try some more contemporary technology then a floating or sinking de-icer may be more your speed. These de-icers actively work to keep an area of ice open on the surface of your koi pond water garden. De-icers of this type simply plug in, no moving parts, and come in varying wattages depending on what your de-icing needs may be. They are sold by most water garden centers and pond professionals, or online, and can cost anywhere from $60 to $180, or more. The floating / sinking de-icers are a popular go-to equipment selection that most pond pros and water garden centers will direct you to for de-icing your pond. Submerged pond pumps can also be used, but are best applied to larger scaled ponds. A submerged pond pump will keep the surface of the pond agitated enough to de-ice an area of your pond. When using submerged pond pumps for de-icing your pond be aware of how much water is being moved, and how this water flow affects your entire pond. Submerged pumps have the potential to be too aggressive and over circulate your pond during winter months which may cause unnecessary stress to your koi and goldfish. If you want a pond de-icer that is more versatile, then a pond aerator should interest you. Aerators will actively and aggressively keep and area of ice open on the surface of your pond even when the floating de-icers are struggling to keep up. During times of single digit, sustained below freezing weather, the pond aerator will keep chugging along de-icing your pond and de-gassing your pond very efficiently. Aerators are another popular choice of the pond professionals. Aerators work great as a stand alone method of de-icing, but paired up with a floating pond de-icer will give most pond owners real peace of mind during those sometimes brutal winter conditions. De-icing your pond is not the same as heating your pond (thats another blog post! ), but it is a great way to ensure that your koi pond water garden is still staying healthy while it is sometimes hidden below the snow during Ol’ Man Winter’s brief reign over the land. Choose the de-icing method that fits your personality, and your budget, but choose one; your koi, goldfish, and pond critters will benefit from it. Enjoy the winter dynamic of pond keeping and all the amazing, but fleeting, beauty that it brings; but keep that one little area open for the health of your pond. The fish and critters will thank you for de-icing your pond aka their home, come Spring! Think Spring!! Fantastic blog!! 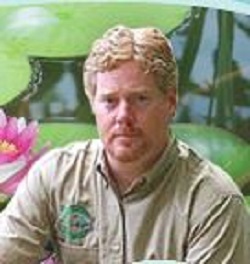 I agree with your blog, here you have written excellent information about how to deice your koi pond water garden. It’s helpful information for us. Thanks for sharing your excellent knowledge.